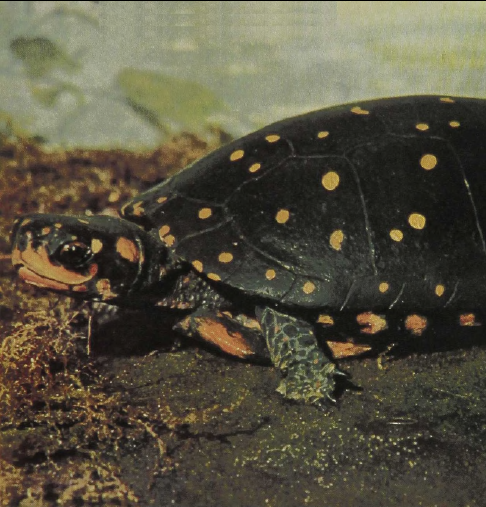 The Spotted Turtle is one of the prettiest of North American turtles. Specimens are easily recognized by the series of bright-yellow spots scattered across the blue-black background of its shell. The ventral surface is yellow to orange and has black blotches along the outer edges. Spotted Turtles favor marshy areas and are omnivorous, capturing food on land and in the water. They prefer cooler temperatures than many other turtles and have been observed mating at 10°C (50°F). Though it ranges from extreme northern Illinois east to Massachusetts and in a narrow belt south along the coastal states to Georgia, the Spotted Turtle is not common anywhere.